In 2008, Google said there’s no such thing as complete privacy. You’re being tracked all over the web by their AdSense ads, by sites that use Google Analytics and – probably the most important – their search engine. But Google Search isn’t the only search engine that tracks your behavior. Concerned about your privacy? In this article, we’ll show you how you can get rid of click tracking in search engines. Whenever you click a link in Google Search, your click is redirected through a secret URL. If the site you’re going to is http://www.cybernetnews.com/, Google will do a secret redirect through a URL that looks similar to http://www.google.com/url?url=http://www.cybernetnews.com/. 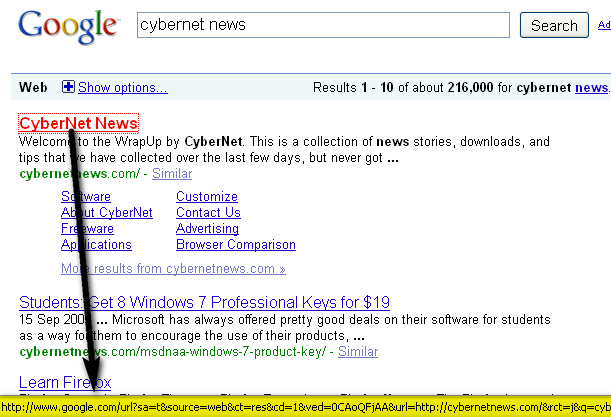 In some cases, you can reveal the secret redirect by right-clicking on a linked search result. If that doesn’t work, your last resort is an HTTP sniffer. 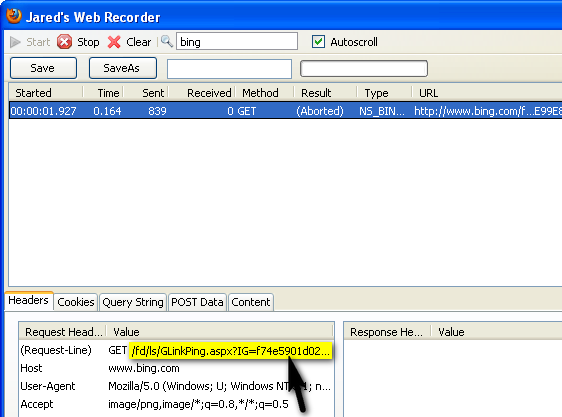 There are several Firefox add-ons that claim to get rid of Google Search’s click tracking. CustomizeGoogle is one of them. Among other tweaks, it promises to remove click tracking and disable Google Analytics cookies. If you just want the anti-tracking feature without the bells and whistles, there’s a Greasemonkey script you can download called Google Tracking B-Gone. To use Greasemonkey scripts, you need to install the Greasemonkey add-on for Firefox. Also, if you use an international version of Google such as google.co.uk, you have to change the script’s URL range from http://*.google.com/* to http://*.google. */* to ensure that the script is allowed to operate on your local Google site. Unlike Google’s redirect, the one Yahoo uses is always easy to find. Right-click on a link and look at your status bar to reveal an intimidating garglemesh of strange characters originating from rds.yahoo.com. You can get rid of that by installing this Greasemonkey script. However, my HTTP sniffer revealed that Yahoo does some additional click tracking from a URL that starts with http://search.yahoo.com/ra/click?. 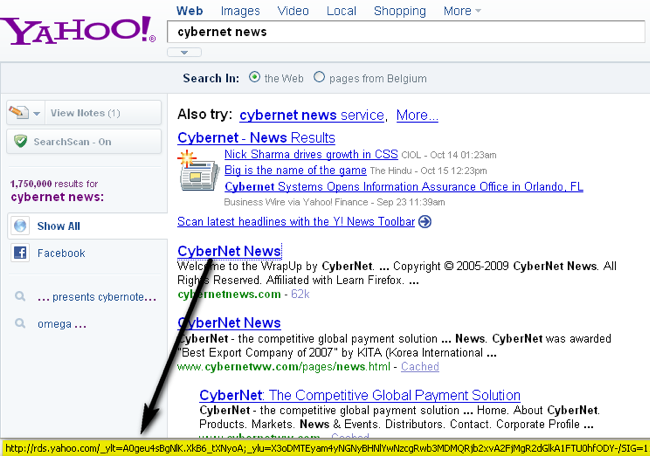 To disable this, add http://search.yahoo.com/ra/click? * as a filter to Adblock Plus. Although the tips listed above can help you stop search engines from tracking your clicks, it does not keep websites from gathering information about your web search. This is done through the HTTP referrer. Any page on the web can retrieve information on how you stumbled upon it, i.e. which URL referred to their web page. The referrer is also known to be used by site owners to retrieve information about the search engine you used and what your search query was. On rare occasions, some sites alter themselves if you found them through web search. For example, I’ve seen sites display “Welcome, Googler!”-esque messages and even sites that highlight your Google search terms on the page you landed on. Although this rather creepy practice is not widespread, it just shows how much a site really knows about you. Fortunately, you can disable the sending of the HTTP referrer to the websites you visit. While it is possible to disable the HTTP referrer entirely in Firefox’s about:config, this can break certain functionality on some sites. There’s a Firefox add-on called RefControl that does away with this issue by allowing you to add exceptions for sites that need the referrer. IE/Opera: How do I Disable Sending Referrers? Safari: Is there a way to disable header referrals in Safari? Since I’ve only tested this with Firefox, I cannot guarantee that the content from these resources is accurate.